Our home, especially the rooms we use everyday, should clearly indicate our style, color preferences and aesthetic tastes while making us feel comfortable, calm, and safe. This is why we call it home in the first place. 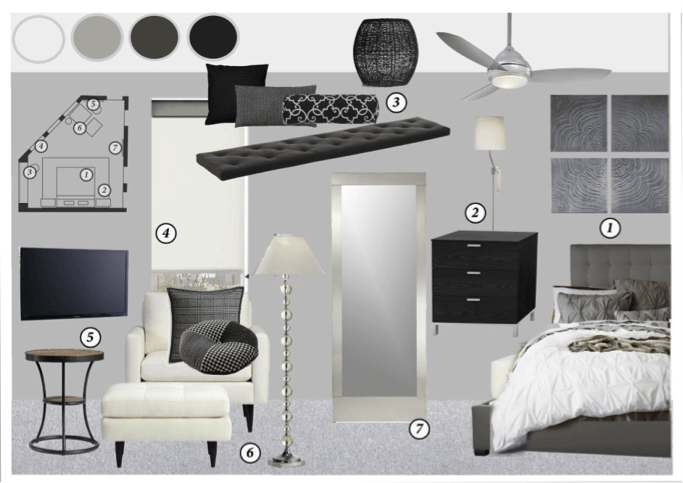 But what if you like monochromatic rooms, and what if your favorite colors are grey and black? How would you create an interesting and non-monotonous space without any color? Our client, Debbie, for example, loves white, grey and black. 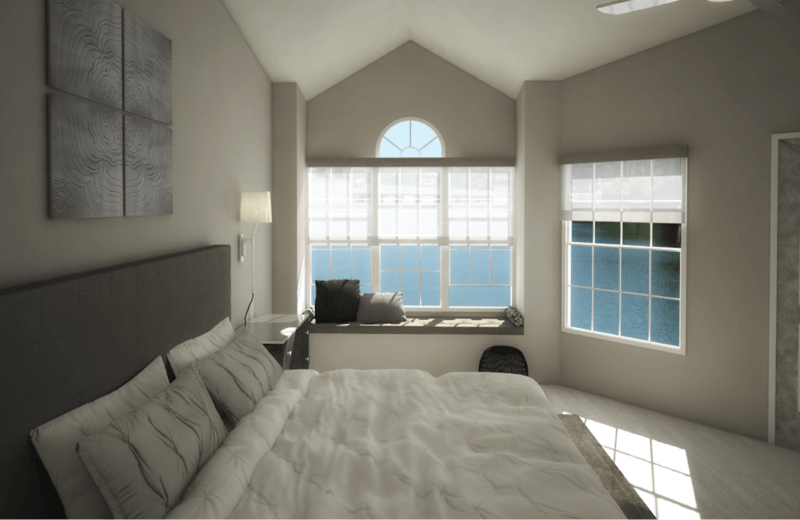 She decided to take on that color challenge for her bedroom and designed her room online with Decorilla. She wanted her bedroom to be modern, polished, functional, and organized but also calming and relaxing. The highlight of the room is the stunning view offered by three big windows facing the water. It was important to make sure the decor of the room reflected the tranquil environment outside. 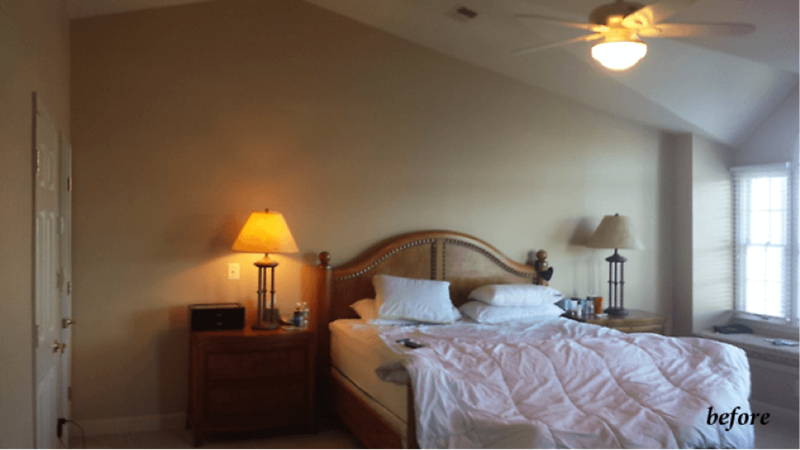 Here’s how we transformed her room keeping five key tips in mind! There are usually a few different areas of interest in any room due to activities designated to each area, even if the room is small. For example, in a living room you may have a sectional facing the TV (activity: watching TV) and an armchair near a bookcase (activity: reading). While all activities take place in the same room it is nice to create smaller groups of items and highlight them accordingly. 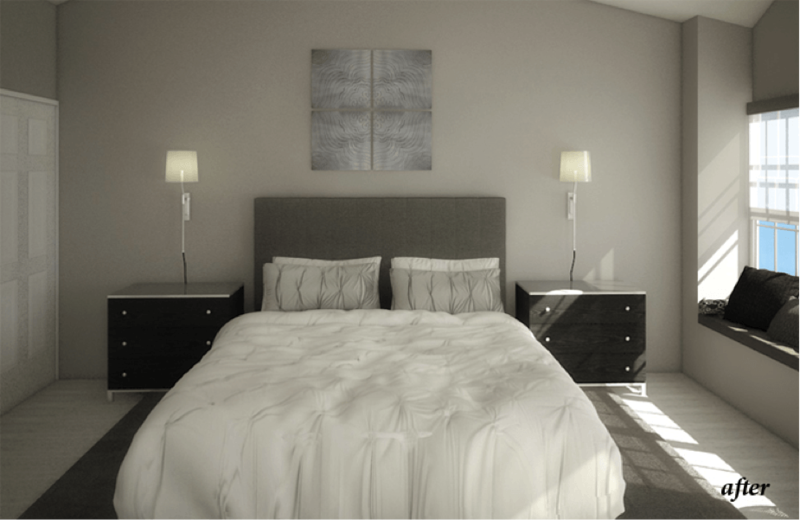 When decorating a large bedroom in shades of black, grey and white, it is easier to indicate the various activities by using contrast. In Debbie’s room, we have three different areas of interest. 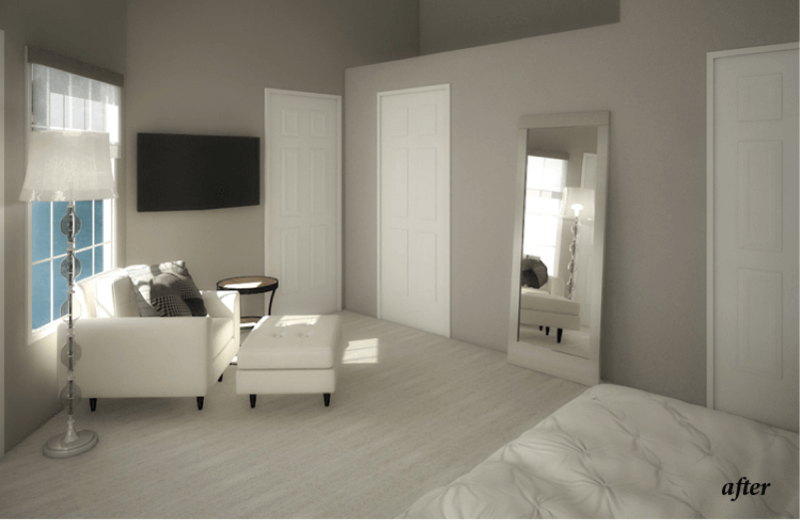 Bed area: While the floors were already carpeted in off-white, a dark grey rug is used to indicate the area of the bed, outfitted with nightstands on both ends. The white duvet completes the idea of contrast. This becomes an inviting place to rest. Armchair: An armchair with an ottoman, a floor lamp, and an accent table are grouped in front of the one window without disturbing the flow of movement in the room. For contrast we used patterned black pillows on a white armchair, completing a perfect reading spot. Window seat: This is one of the brightest spots in the room with a lot of natural light coming in. A dark grey cushion and black and grey pillows create the perfect contrast for this seating area to admire the view outside! Black is a great color to work with and is ideal for a bold look. It is easy to use as an accent color. It highlights the area of interest and surrounding pieces because of the contrast it creates. Surprisingly, it can add real pop and flair to your room. 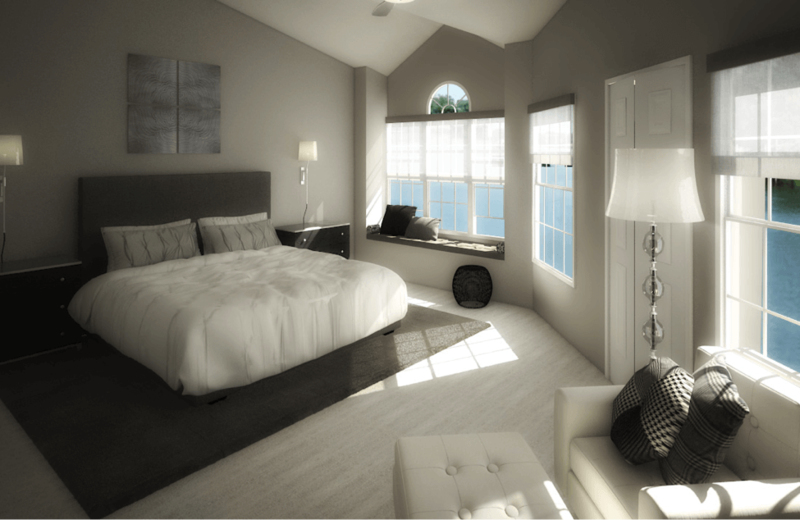 In Debbie’s bedroom, we used black nightstands (2), pillows (3 & 6) and an accent table (5). For a more bold design we could also add shams with black pattern and perhaps some black wall art like this stunning night time photograph or this bold abstract drawing spotted at Zatista. Grey is the perfect color to bring balance into a room with white and black items. When using different shades of grey we can create a gradient feel with different layers of color moving from darker to lighter tones and vice versa. In Debbie’s bedroom we can see the different shades of grey when looking at the bed. The wall is a light grey, the headboard is darker and the shams are lighter. Shades of the same color, used in layers, create balance and flow. When you have a bright room it is nice to “play” with reflections of color by using silk and metallic surfaces. Especially when the room is mostly grey, black and white, the results can be amazing because colors and reflections look different during the day while natural light is changing. In a bedroom we usually have a mirror that helps with the light and the reflections. In Debbie’s case there are some more items to support this idea. The nightstands’ top surface and legs are polished stainless steel. The artwork over the bed has an antique zinc finish and the mirror has a stainless steel frame. There’s also the polished nickel fan light, 2 sconces with polished nickel finish, and a floor lamp with stacked clear glass orbs on a round base with brushed nickel. Even the black accent table is made from Dark metallic wire. All of these accents reflect the black and grey items and increase the polished and chic atmosphere of the room. Repetition is one of interior design’s great principles. It may refer to texture, shapes, patterns, and color. In our case repetition is about color. When we are dealing with black (or any other bold or intense color), it is very important to spread it into the room and repeat it. In Debbie’s room you can see black in three different areas – the nightstands, the pillows on the armchair, and the pillows on the window seat. 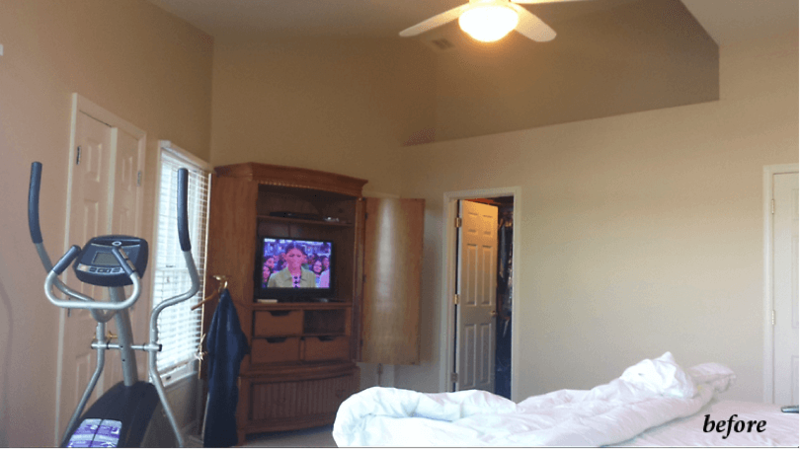 It’s a large room, however, so the TV and the mirror also contribute to the monochromatic feel of this room. Because the TV is black and is wall mounted on a light grey wall, it plays a role in this room that in another room would not be noticed. As for the mirror, it reflects the black pillows of the armchair, adding a black touch to a wall that does not have any other dark colors. Want to see more? 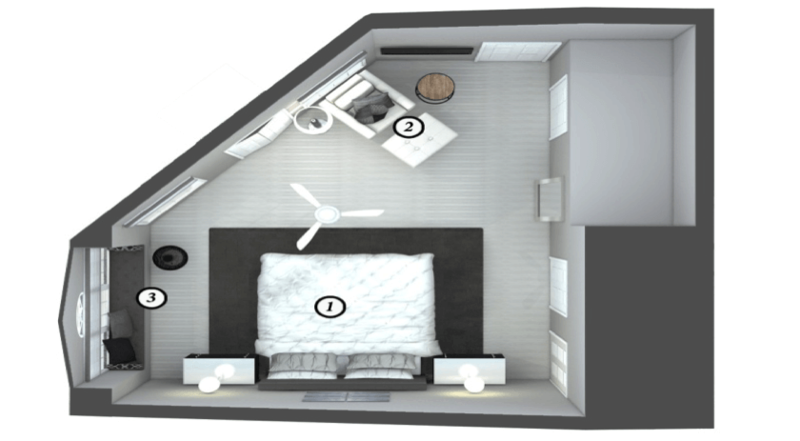 Check out the full online room design project here!